A forum for fans of England. Does anyone think Freddie is retiring from test cricket because the easy dollars are actually in India? Re: Flintoff chasing IPL $$$? Sparchi wrote: Does anyone think Freddie is retiring from test cricket because the easy dollars are actually in India? I come from Preston (Freddies hometown) and i can tell ya that he recognises that this overwhelming 4-0 Ashes win is gonna be hard to top so he's going out on a high. And believe me he dont need the cash. He's got a massive house in cheshire where all the millionaires in the north of england live. I'm gonna have a house round there one day selling my body to wealthy chicks cos i'm bloody gorgeous mate. pommie phil wrote: And believe me he dont need the cash. Perhaps admin could set up an adults only section on this website for you to "sell yourself". All kidding aside I look at the Australian team recent retirements and a lot of them are playing IPL and I think that money is starting to overtake patriotism in the sport we love. I agree mate. Over here in England Sky TV are really pushing the T20 game with live matches every other night. Last season i actually went to Old Trafford to see Lancashire Lightening play a T20 and the ground was full of tiny kids jumping around the seats and paying no attention to the match. Your own Shane Warne has said he fears for the future of Test cricket and if he's right it will be a sad thing. The test game is the heart and soul of cricket and T20 or limited overs matches just add ons at the end of the day. Hmm well, pommie, frankly speaking I don't think Test cricket has a chance of surviving in the future with the continuation of the T20 tournaments. I mean ODI tournaments will have difficulty surviving with the IPL and International T20 Champions League around. T20 cricket is the way of the future. I mean, most of my friends don't watch test cricket at all and we're cricket fans. We used to watch ODI tournaments all the time in the 90s (it didn't matter if Australia/India/Pakistan were playing. I used to watch the Bangladeshi matches too.) I myself watch a lot of cricket and do my best to follow the Ashes but overall the game does seem bland compared to ODIs and T20s. I think T20 cricket is the way of the future. Its possible ODIs may survive but eventually they'll fade away too. Then when people will get tired of T20 cricket, its possible a new type of cricket may evolve that will replace T20 the way T20 replaced Test cricket and ODIs. Its the inevitable evolution of the sport, that's what it is. Its not a new think, everyone knows that IPL is a money machine and everyone want to make money by this. I am designer bags enthusiast who enjoys talking and sharing her ideas on handbags. yeh I know that too ! 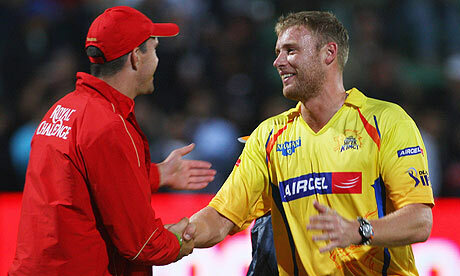 Yes I think Flintoff retiring from international cricket for playing in IPL. Only not he symonds, lee and many other.